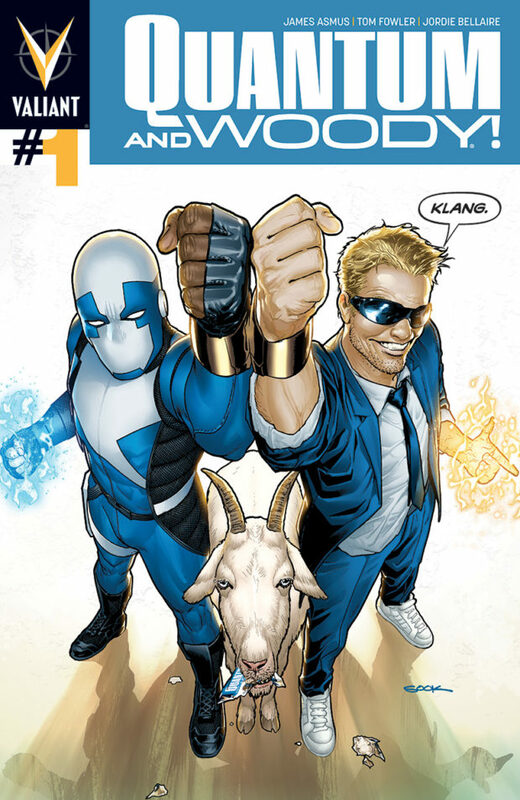 Graphic Novel Review 52/365: Quantum and Woody – Valiant Comics Week! Remember two days ago when I reviewed Archer & Armstrong? No? OK, go back and read it here. Good, now that that’s over, we can talk about Quantum and Woody. Valiant Comics Week! 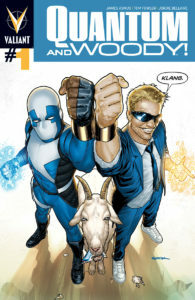 Quantum and Woody is Archer & Armstrong but the heavier rated PG-13 version and not dealing with the occult. Think Deadpool without all the gore, the not so blatant breaking of the 4th wall…and if he had a partner, and a side-kick super-powered goat. Quantum and Woody is the story of two step-brothers, brought back together by the death of their father, only to be framed for his death. Snooping around for clues in their scientist father’s lab, Eric and Woody get transformed with strange powers that they end up using for the power of good. A crazy plot element in issue four has them adopting a super-powered goat, and the rest is history. It’s a strange premise, but it works. I love Quantum and Woody, and don’t tell Marvel, but I prefer this title to Deadpool. This book is straight up funny, and it gets really close to crossing some lines. I’m giving it a 13+ rating, but it’s about one questionable panel away from being 17+. The art, like I have mentioned about Valiant books in the previous reviews, is good…really good, but it’s not game-changing. But the script paired with the silly images makes this book a very fun read. The brothers have a sort of love/hate relationship that is developed through childhood flashbacks and their quest to discover their father’s murderer. Since Eric is black and Woody is white, there are racial jokes tossed in throughout, but they are tongue in cheek and do not seem written to offend. Most of the time, it’s the brothers giving each other crap, and the jokes are covered in innuendo, so much that you might not even react to the race jokes. Love it or hate it, this book is making some waves, and I have my surfboard!